Sólo hay nueve lugares que quedan en el Seminario de Mallorca . En 4 semanas, el pasado 2013 I.H.M. Seminario se llevará a cabo . El Seminario se llevará a cabo en Inglés con un traductor profesional impartir la información a los delegados españoles presentes . El enfoque del seminario será en tomar el caso . No todos los estilos teórico o personal de la determinación de los síntomas, pero un examen detallado de la metodología Hahnemanns e instrucciones. Una vez que esto se ha explorado , la atención se desplazará hacia la manera de examinar el caso , con la vista puesta en las observaciones Hahnemanns sobre Enfermedades Crónicas , y cómo esto afecta o no a la evaluación del estado del paciente, y luego pasar a la forma de obtener prescripción de los síntomas de la information.gathered . El Seminario se trasladará a la utilización de las ayudas repertorial para determinar cómo hacer coincidir la imagen de la enfermedad con un medicamento que es el más similar. Habrá un vistazo a la historia del desarrollo repertorial y una nitidez de enfoque en el Therapeutic Pocket ayuda Book.This de estudio Materia Medica es la metodología más cercano en la existencia de análisis de casos utilizando Hahnemanns thinking.In este día y edad, hay un lamento general para que más y más sustancias que ” probarse” con el fin de hacer frente a la aparición de enfermedades y las enfermedades modernas . En las clínicas IHM y centros de investigación , hemos encontrado que los medicamentos originales existentes ya poseen la similitud con las patologías modernas , pero no se conocen simplemente porque los profesionales modernos ya no leen las fuentes ! Este seminario es un llamado a la comunidad homeopática para echar un vistazo largo y duro en la práctica original de la homeopatía y ver que sus principios y , más importante aún, que su eficacia no se ha superado desde los primeros días de la utilización de los llamados , técnicas mejoradas y “pensamiento moderno” . El I.H.M. y P & W se enorgullece en anunciar todo el nuevo único programa informático ESPAÑOL para ser lanzado en el Seminario . Se incluirá la última versión española actualizada de la edición del libro de bolsillo terapéutico , Materias Médicas y escritos de los maestros de P & W 2014 . Se actualizará de forma gratuita, más obras están traducidas en español . Para los asistentes del seminario , vamos a ofrecer el programa a un precio especial seminario. También habrá un sorteo gratis para los delegados para ganar un programa. 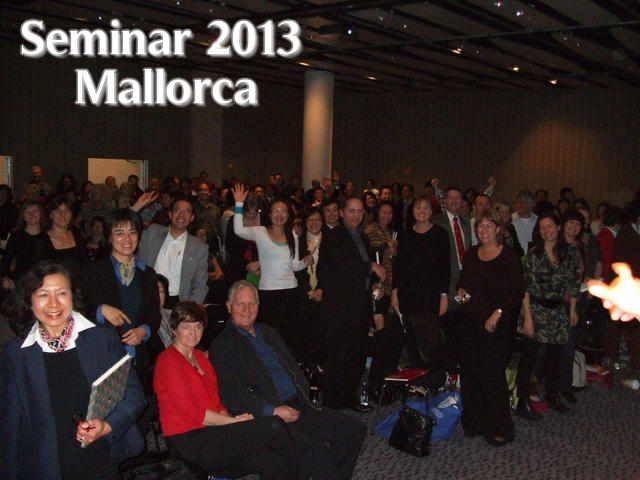 There are only Nine places left at the Mallorca Seminar. In 4 weeks the last 2013 I.H.M. Seminar will take place. The Seminar will be conducted in English with a professional translator imparting the information to the Spanish delegates present. The focus of the seminar will be on case taking. Not any theoretical or personal style of ascertaining symptoms, but a detailed examination of Hahnemanns methodology and instructions. Once this has been explored, the focus will shift towards HOW to examine the case, with an eye on Hahnemanns observations regarding Chronic Disease, and how that affects, or not, the assessment of the patient state, and then moving on to how to elicit prescribing symptoms from the information.gathered. The Seminar will move on to the use of repertorial aids for determining how to match the disease picture with a medicine that is the most similar. There will be a look a the history of repertorial development, and a sharpening of focus on the Therapeutic Pocket Book.This aid to Materia Medica study is the closest methodology in existence for case analysis utilising Hahnemanns thinking. In this day and age, there is a general lament for more and more substances to be “proved” in order to tackle the onset of modern illnesses and diseases. In I.H.M clinics and research facilities, we have found that original existing medicines already possess the similarity to modern disease states, but are not known simply because modern practitioners no longer read the sources! This seminar is a call to the homoeopathic community to take a long hard look at the original practice of homoeopathy and see that its principles and, more importantly, that its efficacy has never been surpassed since the early days by utilising so called, improved techniques and ‘modern thinking’. The I.H.M. and P&W are proud to announce an all new SPANISH only computer program to be released at the Seminar. It will include the latest Spanish updated version of the P & W 2014 edition of the Therapeutic Pocket Book, Materia Medicas and writings of the masters. It will be updated free of charge as more works are translated in Spanish. For attendees of the seminar, we will offer the program at a special seminar price. There will also be a free draw for delegates to win a program. There are a couple of dates available for booking the room for a seminar in Mallorca. Due to the increase in V.A.T. being imposed on Spain, the room rates have increased a lot. It is preferable to book the room for the comfort of the number of attendees rather than book a too large room for huge extra cost. A two day seminar will cost between £350-£400 . This will include break refreshments and snacks. There will need to be a minimum of 5 and a maximum of 20 attendees. The dates available are: September 28/29th. October 5/6th or October 12/13th. Please check your calendars and respond to the email address at the top of the page with the date that suits you. I have checked flight availability and hotel rates and the most reasonable appears to be October 5/6th. I will however see which date suits most people. First of all, a flight and a weeks stay in Mallorca will cost from a very reasonable £200. I recommend http://travelrepublic.co.uk for good service and prices. I can suggest hotels that I am familiar with once a date and area is decided on for holding the venue. I have always recommended for those attending a seminar to arrive on the Thursday before the weekend, get relaxed, come to the Seminar and work hard, then have a few days off before returning home on the Thursday. It will be a little cooler in October, yet still pleasant and generally comfortable weather. Some attendees have even brought their spouses and children and had a holiday. For those that request a private consultation, I am available after the seminar. If anyone attending wants to be involved in a Seminar live case taking session in front of attendees, the consultation will be free. (Follow ups will be via SKYPE or landline telephone for a follow up fee). We request a deposit of £100 when you book your place. The balance to be paid 4 weeks prior to the commencement of the Seminar. We invoice through PAYPAL. We would also suggest that once committed, you book your flight and accommodation to ensure transport to the Island. http://travelrepublic.co.uk ask for a deposit and the balance paid 4-6 weeks prior to flying. Most companies do this now. You can bring whatever repertory you are comfortable with. I will be demonstrating via Powerpoint and computer projection, the strengths of Hahnemanns method and how to use the repertory. If you are bringing a laptop, do not forget that Spain requires an adaptor for the power plug. Attendees will also be offered a special Seminar price on Repertory Software.